School bomb threats increasing yearly. 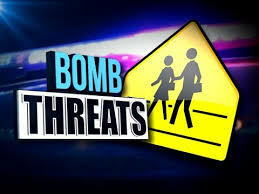 According to the Prince George’s County Public School Code of Student Conduct Memorandum of Understanding, making a bomb threat can result in a level-three offense, mostly handled by extended suspension, although sometimes the students are charged as adults. Although this threat happened outside of school, administration reinforces the procedures that should take place for student and staff safety. In 2016 a total of 1,536 bomb threat incidents were reported, 88 of which came from Maryland. The other states were Illinois (170), Texas (112), Ohio (109). 529 of that total 1, 536 bomb threats were threats made to schools. Since 2014, there has been an 33% increase in threats to schools. However, some students feel these threats are not something schools should get used to. Although students may feel like they are in the dark sometimes with the standards and procedures of threats, administration does everything in their power to assure safety throughout the school. “Every threat we take serious because we want to ensure our families are safe and our students are safe and our staff are safe. Also from a parent perspective, no parent should ever be fearful that their kids are going to be in danger when they come here [Parkdale High School]” said Dr. Mugerwa. While most of these threats are done outside of school, consequences of making them are still very severe and very real. During the month of December, schools, businesses, and government offices across the nation were evacuated because of bomb threats. Unfortunately, that’s not the first of the incidents. According to BBC News, 2018 was the worst year for school shootings in the United States, 113 people have been killed or injured. Notify your facility supervisor, such as a manager, operator, or administrator, or follow your facility’s standard operating procedure.